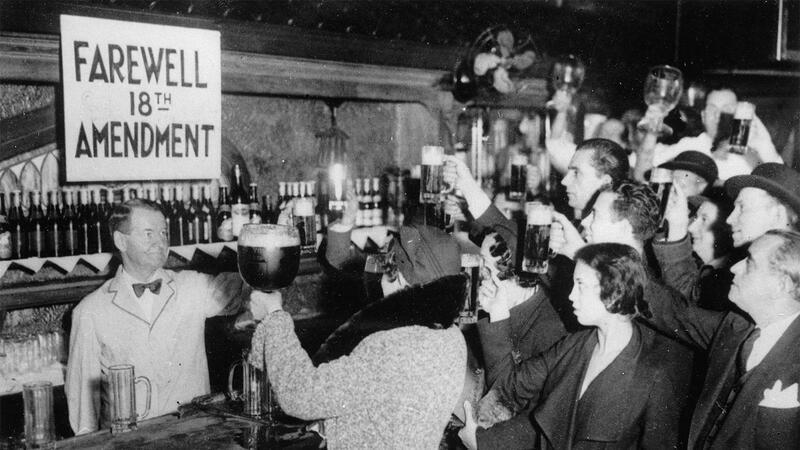 It's the 85th anniversary of the 21st Amendment. Remember that? New Yorkers celebrate the end of Prohibition in 1933 with appropriately sized beverages. It's hard to imagine that once there was a time when you couldn't enjoy your favorite tipple (well, legally, at least). Today is Repeal Day, marking the 85th anniversary of the repeal of Prohibition, a nearly-14-year federal ban on booze that seemed like a good idea to some people at the time but ended up causing quite the mess. Since "the Noble Experiment" concluded, the U.S. wine industry has been rebuilt to the flourishing state it's in now, and the rest is history—although there are lasting effects. This piece of our past has inspired many books and documentaries on the subject. How well do you know it? Here are some fun facts. 1. Prohibition is the only amendment to the Constitution to have ever been repealed. In 1919, the 18th Amendment was ratified, putting Prohibition in place one year later; it was repealed Dec. 5, 1933, marking the first time in U.S. history (so far) that we backtracked on an addition to the Constitution. Basically the 21st Amendment was just a big "Whoops, never mind." How did things go so awry? We'll get to that …. 2. Women were at the forefront of the push for Prohibition. Anti-alcohol sentiment had been around for a long time, but the women-led temperance movement really gained momentum after the Civil War, particularly where saloons proliferated. In short, women saw alcohol as a home-wrecker, and were tired of their husbands being drunk all the time, often leading to abuse and poverty. Actually, the Prohibition movement led to women's suffrage: Supporters believed that giving women the right to vote would increase votes for temperance candidates. 3. Anti-immigrant and anti-black sentiments helped the cause along. Some supporters of temperance "looked around their country and decided they didn't like who was drinking," wrote Wine Spectator news editor Mitch Frank in his blog on the subject last year. It was in many ways a campaign of fear, fueling people's resentment toward African Americans' social gains since Reconstruction, as well as toward the poor European immigrants who had been arriving in the country by the millions. Racist arguments made the case that somehow these people were the only ones who couldn't handle their drink. 4. Drinking alcohol was not outlawed by the federal government during Prohibition. That's right. The actual act of consuming liquor was not what the 18th Amendment banned. Instead, it prohibited the "manufacture, sale or transportation of intoxicating liquors," so you could technically drink all you wanted, but the means by which you obtained that liquor were probably illegal. "I'll have the Bathtub Martini, shaken, not stirred." 6. The transportation part of Prohibition, however, caused quite the headache for a certain commander in chief. President Woodrow Wilson had a personal wine cellar in the White House, but by the time he left office in 1921, Prohibition was the law of the land. As if moving weren't stressful enough, he had to figure out how to transport his wine to his new digs. Luckily, he was granted an exemption from Congress. Must be nice to be president. 7. A presidential candidate got elected by campaigning on Repeal. In 1932, a guy named Franklin D. Roosevelt ran for president on a platform that included ending Prohibition. Instead of restoring the U.S. to the sane, respectable nation (or whatever) temperance leaders had hoped for, he argued, the 18th Amendment had spurred on organized crime, bootlegging and secret boozy parties held in the speakeasies that today inspire so many trendy establishments. There was growing sentiment that the ban had to go, which was exacerbated by the Great Depression. Frankly put, state and federal governments kind of needed those tax dollars. Upon Repeal, President Roosevelt reportedly said: "What America needs now is a drink." 8. Utah was the state that technically ended Prohibition. Say what? Yep, on the evening of Dec. 5, 1933, Utah—not exactly known today for its liberal attitude toward alcohol—became the 36th state to ratify the 21st Amendment, the last needed to write it officially into the Constitution. The first state to do so was Michigan, on April 10, 1933. 9. You couldn't (legally) get a drink in Mississippi until 1966. Indeed, the Magnolia State didn't quite join in on Repeal Day celebrations. It was a full 33 years after that day that Mississippi's ban on booze sales was overturned, and 58 years after it had instituted its own statewide Prohibition, even before the 18th Amendment. Mississippi was the last state in the Union to repeal its law, after Oklahoma in 1959 and Kansas in 1948—but even today, dry counties and municipalities linger around the country. 10. Eighty-five years on, interested parties are still battling it out over liquor laws. Section 2 of the 21st Amendment gave power to the states to decide their own alcohol regulations, creating a patchwork of hundreds of different rules in each state or local territory regarding where and when alcohol can be sold (for example: only by the state, through a three-tier system, not in grocery stores, not on Sundays, and so on). But it also left open some pesky questions over whether states or the feds have jurisdiction, most notably when it comes to the legality of ordering wine from out-of-state wineries and retailers. (The Commerce Clause of the U.S. Constitution says states can't create trade barriers; the 21st Amendment says they can when it comes to alcohol—for the purpose of temperance or an orderly market, and not for economic protectionism, according to court rulings.) Wine Spectator has been following that debate from well before the Granholm v. Heald decision to the newest case on liquor, Tennessee Retailers v. Blair, which will be heard by the U.S. Supreme Court early next year.